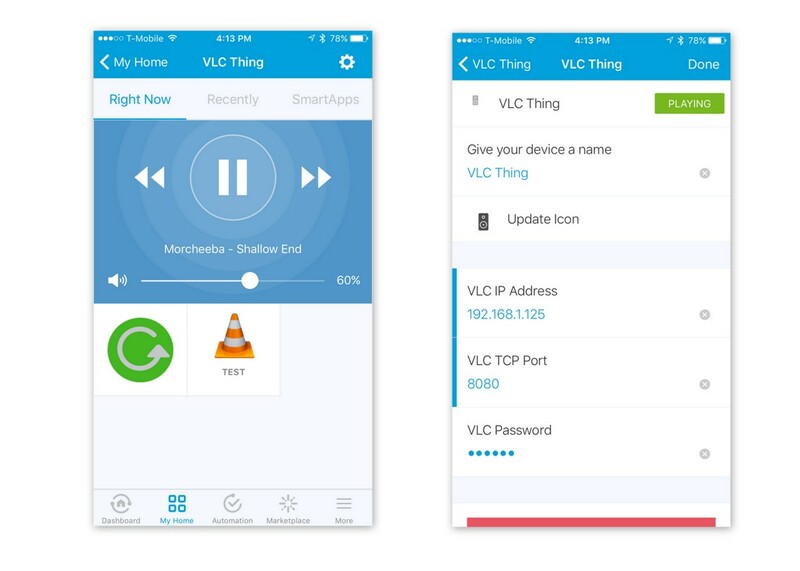 “VLC Thing” is a custom SmartThings device driver that controls VLC media player and emulates Sonos audio player, making it possible to use Sonos smart apps to play sounds and voice (text-to-speech) notifications. VLC is a free and open source cross-platform (Linux/MacOS/Windows) multimedia player and framework that plays most multimedia files as well as DVDs, Audio CDs, VCDs, and various streaming protocols. How are you using STs for Christmas? Voice notifications using local computer for TTS audio rendering? What are the best projects on SmartThings? @geko Ok, I’m sold! Where can we get it and where can we send you some coin!! Seriously, you write some awesome apps!! Have you tested it with VLC on either iOS or Android? That will be the first thing I will be trying. We’re also very close to releasing the SmartApp that supports the ObyThing music player for Mac. It is pretty dang awesome and takes all existing Sonos commands like a champ. Very cool! Will i be able to set it to use specific airplay devices? If so… thats awesome!!! Where can we get it and where can we send you some coin!! It’s coming soon, hopefully this weekend. Just wanted to give community a preview. VLC is an excellent and completely free, open-source player. Works on Mac, Linux or Windows. There’s no additional software to buy and install. Free and simple! This seems insanely practical…if I could just wrap my head around a way to get the audio from my Mac (or Pc) through the rest of my home. Will i be able to set it to use specific airplay devices? If you use VLC for Mac, it should be possible to redirect audio output to AirPlay speakers. Have you tested it with VLC on either iOS or Android? VLC for iOS is not currently available. I doubt that VLC for Android supports remote control, but I’ll check. There is an airplay option, yes. Testing out a bit more tonight. Any non Mac solutions being worked on? Mac based solution: Require expensive hardware, or use of an Apple device (which I am not a huge supporter of). Would love to know some other options/hardware is down the pipe, even if it is a bit off in the distance. I am waiting for this as well! This is awesome! I am thinking if VLC and NAS box can be integrated with this approach/support? Did you guys see the VLC things above? The “VLC Thing” can control VLC media player running on Linux, Mac or Windows. Look forward to trying this with a Raspberry Pi! @geko. Any update on the progress? Can it currently be used with the sonos smart apps? It does not seem to be working for me except for the test option. The test and the control of the VLC player work but the Sonos smart apps aren’t working for me either. You cannot expect full Sonos compatibility, but event notifications using “Sonos Notify with Sound” smart app do work for me, as shown in the demo video. What app are you using? Yeah, that’s the app I’m using but nothing happens when I open the door. For info, I’m on android and I can correctly control VLC apart from that.